A common misconception among first-time microscope purchasers is that more magnification is always better. Unfortunately, any microscope that advertises magnification above 1000x is offering empty magnification. You can learn more about empty magnification here. The limiting factor in a microscope is not its magnification, but rather its resolution. Resolution refers to the shortest distance between two separate points in a microscope's field of view that can still be distinguished as distinct entities. Imagine a drawing that was made with large children's crayons, versus a drawing made with a sharp pencil. Microscopes with poor resolution will provide images that are similar to the crayon drawing, as the images will not be crisp and clear. 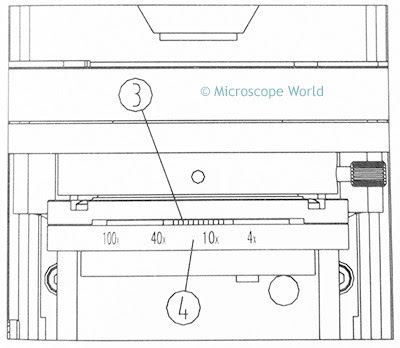 Numerical aperture determines the resolving power of a microscope objective lens, but the total resolution of the entire microscope is also dependent on the numerical aperture of the condenser (located beneath the stage on a compound biological microscope). The higher the numerical aperture of the complete microscope system, the better the resolution will be. Aligning the microscope optical system is also important to ensure maximum microscopy resolution. The condenser must match the objective with respect to numerical aperture and adjustment of the aperture iris diaphragm. There is a great article here that discusses how to properly align the condenser as well as set the field iris diaphragm. The sketch below shows alignment of the iris diaphragm on the condenser (3) to match the objective value (4) of the current objective being used. Wavelength of light is an important factor in the resolution of a microscope. Shorter wavelengths will yield higher resolution. Therefore, the greatest resolving power in optical microscopy is realized with near-ultraviolet light which has the shortest effective imaging wavelength. When using near-ultraviolet light special Near-Ultraviolet microscope objectives are used. The resolution of a microscope provides the ability to view samples and specimens clearly. The main factor in determining resolution is the objective numerical aperture, but resolution is also dependent upon the type of specimen, coherence of illumination, degree of aberration correction and other factors such as contrast enhancing methodology in either the microscope's optical system or the sample itself.